Sod can dry out, quickly. We take every precaution and action to ensure that the sod comes straight from the field to your site. We have sod delivered straight from the source, and we start laying down the pieces as soon as it arrives on site. Without a sacrifice to quality, we work swiftly to get your sod on the ground ensuring that it’s saturated, and growing as soon as possible. Accuracy counts when it comes to laying sod. 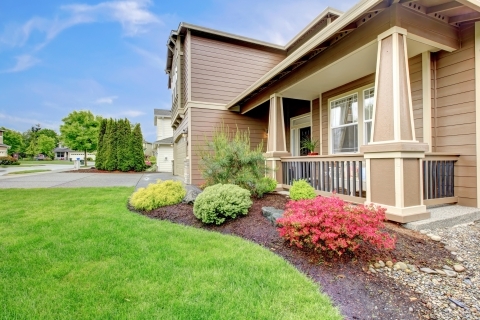 Without maintaining proper lines and edges, your lawn can look like a mess. We strive to make sure that each edge is perfectly aligned. With edges that are overlapping, you’ll have swales in your yard. With gaps between sod sections, your sod is less likely to thrive, and water is more likely to pool up. It’s essential to water your sod as soon as it’s laid. Watering your new lawn establishes the sod in its soil. We’ll thoroughly drench your new yard as soon as we’ve laid a section of sod. On top of that, we’ll make sure that your yard is properly irrigated. We can install a sprinkler system to suit the demands of your lawn. We’ll align sprinkler heads and check their coverage once the sod is laid. A lush lawn demands proper watering. We’ll make sure that happens. If you’re ready to get started, give us a holler. We’ll get your sod installed in a jiff, so that you can enjoy your new lawn.